Today's post will be rather short, demonstrating a set of functions from the psych package, which allows you to conduct analysis by group. These commands add "By" to the end of existing functions. But first, a word of caution: With great power comes great responsibility. This function could very easily turn into a fishing expedition (also known as p-hacking). Conducting planned group comparisons is fine. Conducting all possible group comparisons and cherry-picking any differences is problematic. So use these group by functions with care. Let's pull up the Facebook dataset for this. This is the full dataset, which includes all the variables I collected. I don't want to run analyses on all variables, so I'll pull out the ones most important for this blog post demonstration. First, I'll run descriptives on this smaller data frame by gender. In this dataset, I coded men as 0 and women as 1. The descriptive statistics table generated includes all scale and subscale scores, and gives me mean, standard deviation, median, a trimmed mean (dropping very low and very high values), median absolute deviation, minimum and maximum values, range, skewness, and kurtosis. I'd need to run t-tests to find out if differences were significant, but this still gives me some idea of how men and women might differ on these measures. There are certain measures I included that we might hypothesize would show gender differences. For instance, some research suggests gender differences for rumination and depression. In addition to running descriptives by group, I might also want to display these differences in a violin plot. The psych package can quickly generate such a plot by group. 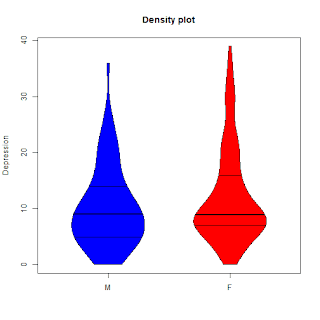 ggplot2 will generate a violin plot by group, so this feature might not be as useful for final displays, but could help in quickly visualizing the data during analysis. 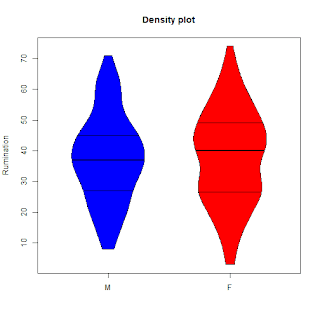 And you may find that you prefer the appearance of this plots. To each his own. Another function is error.bars.by, which plots means and confidence intervals by group for multiple variables. Again, this is a way to get some quick visuals, though differences in scale among measures should be taken into consideration when generating this plot. One set of variables for which this display might be useful is the 5 subscales of the Five-Factor Personality Inventory. 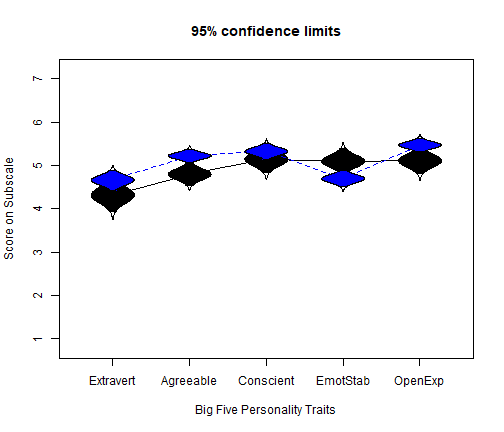 This 10-item measure assesses where participants fall on the so-called Big Five personality traits: Openness to Experience, Conscientiousness, Extraversion, Agreeableness, and Neuroticism (Emotional Stability). These subscales are all on the same metric. Finally, we have the statsBy function, which gives descriptive statistics by group as well as between group statistics. This functions generates a lot of output, and you can read more about everything it gives you here. ##               Rmnt. DpRl. Brd.b Rflc. SvrP. SvrN. SvrT. AntP. AntN. AntT. ##               MmPs. MmNg. MmTt. RmPs. RmNg. RmTt. LfSt. Extr. Agrb. Cnsc. ##               EmtS. OpnE. Hlth. Dprs. ##               Rmnt. DpRl. Brd.w Rflc. SvrP. SvrN. SvrT. AntP. AntN. AntT. The variance explained by gender is quite small for all of the variables. Instead, the relationships between the variables seem to be more meaningful. A to Z is almost done! Just Y and Z, plus look for an A-to-Z-influenced Statistics Sunday post!